This simple yet versatile command is something that belongs in every dogs repertoire. The “place” command is also often referred to as “spot”, “bed”, or “settle”. The basic premise is the ability to point to a spot and have your dog lie down and wait – until given a release command. This is perfect for situations where you need to keep your dog isolated (or calm them down!) for the safety of themselves or the sake of other people! You don’t need much for this trick – which is one of the best things about it. After it has been learned you can do it virtually anywhere. Clicker – This is a great option from Amazon. 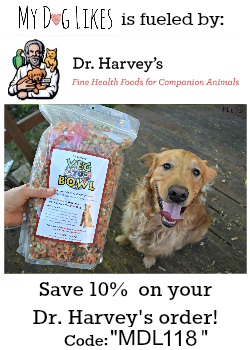 Dog Training Treats – Here are a few of our top recommendations! 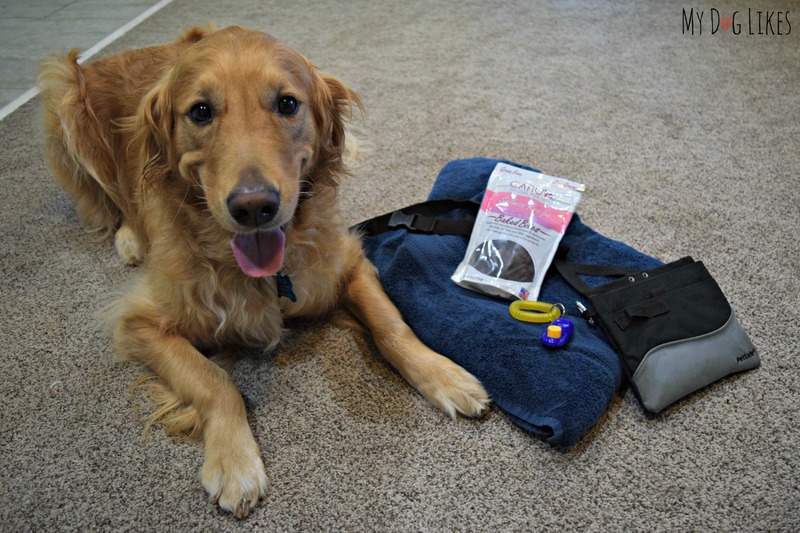 Training Pouch – We highly recommend this one from PetSafe. Towel, Bed, Blanket, Shirt or anything to indicate a “target” to direct them towards. Before any session of clicker training you will want to reacquaint them with the device. This is done through a quick “charging” session of clicking and feeding treats. No trick required – just associating positive feelings to the sound of each click. 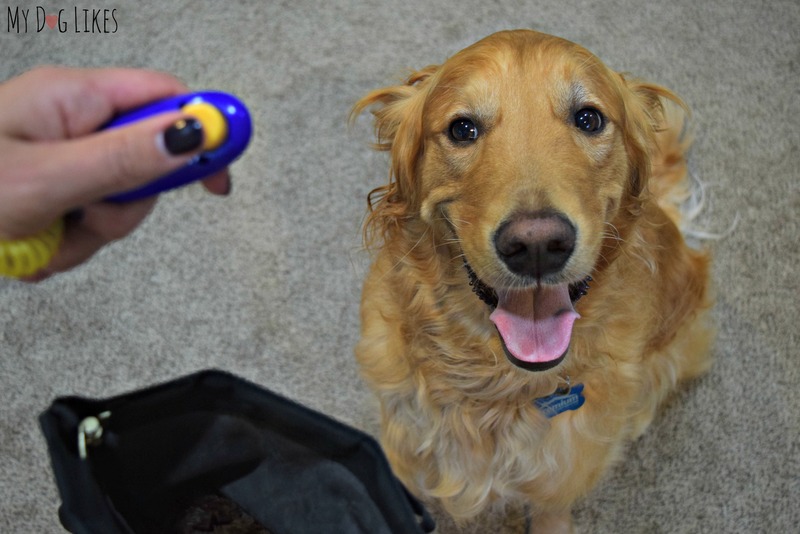 If your dog has never used a clicker, welcome to the world of positive behavior training! Using a clicker is one to easiest ways to positively reinforce desired behavior. Stick with this step until your dog consistently associates the click with a treat. You’ll know the clicker is “charged” when your dog stops whatever he/she is doing when they hear the sound to look at you for a treat! Next up you will introduce a towel (or whichever target you have chosen), by laying it out on the floor. When we worked on this step, we chose a towel because of its versatility and mobility. Even if your end goal is for your dog to go to his/her bed with this command, using an everyday object will help with generalization as that item can always be placed on a bed or in a spot later on (see our bonus video at the bottom of this post). 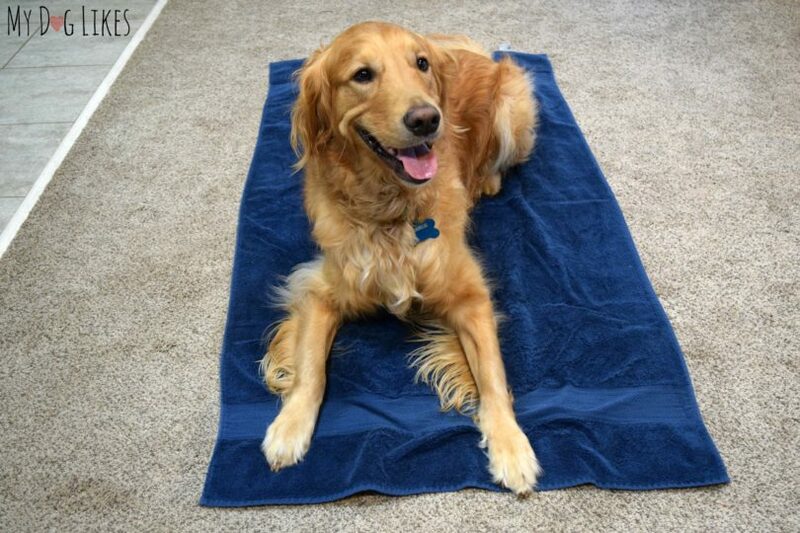 The goal of this step is to reinforce your dog whenever he or she interacts with the towel. Don’t be too picky at first! Even when your dog looks or leans in it’s direction that is a good sign! Move around your chosen “place” to encourage your dog to explore it. Work in a small room or keep your dog attached to a leash to help focus their attention where you want it. Also, keep distractions like favorite toys out of the room. At this point, they will be eagerly and excitedly trying to figure out what you want them to do and some environemental controls will go a long way! As soon as you see a nose, paw, or body part on the towel-click and treat, click and treat! Continue working on this action until they get the idea that standing directly on the towel and ultimately laying on it is the sweet spot! You can accomplish this by going slowly and reinforcing them less often for simply putting a paw on the towel and only when they lay on it. Now that your dog is starting to understand that the towel is a good place to be, it is time to add the command you wish to pair with the action. We use “place”, but other common varients include “home”, “bed”, and “spot.” Whichever word you choose, you will want to start repeating it (along with the click and treat) every time your dog gets onto their target. Once your dog can consistently lay on their spot when given the command, think about adding some sophistication to your trick! You can turn it into a steady obedience command by adding time to their stay on target or moving the target item into new spots, on a dog bed, etc. (see below) After a bit of time you will be able to point to just about anywhere and get your dog to settle! Now that your pup has mastered this skill, learn how to teach the reverse with dog boundary training! Also, make sure to visit the links below where our fellow pet bloggers are teaching more great tricks as a part of the annual Trick or Treat Giveaway Hop! I like to believe my dog can spell. I spell out the words TREAT and LUNCH. This command is on Madison’s homework list this week for her Puppy Einstein class. Bailie and I can do it, but it is a tough one for Madison to learn. no. my dog doesn’t know this…she doesn’t really know any tricks but she is a great lap dog!! We have never tried a clicker. We are working on the place command but don’t have it yet! The only trick my dog knows is how to follow me everywhere I go. I have honestly never heard of this trick before now, but I think it is brilliant!! I rescued a stray a year ago and he has all of the basic commands down, as well as some fun ones. I’m definitely going to try this one next. Thanks!! We are still a work in progress, but we are getting there slowly on our place command. I just use hand commands and treats and that seems to be working pretty well. I don’t have a dog, so no. Cat person here. But if I were to win any doggy prizes, they’d be donated. My dog knows lots of commands and a few tricks! We don’t use a clicker though. as far as tricks go she knows high-five, shake, through (go through a hoop), and twist! Our dog already knows this trick. She knew it when we got her at 3 years old. I am interested in trying the method above in teaching her new tricks. Thank you so much for the detailed explanation of the method! We know the command go to your house. It means we get in our crate and wait. Mom taught us when we were puppies, but we don’t use clickers in our house. One of us was abused before we found this home and clucker noise scares him, so we use voice command and no clicking. My pup knows this trick but we never used a clicker. I have 1 cat and 1 kitten….but, they would love a $300 shopping spree at PetSmart! My 9 year old cat thinks she’s a dog sometimes, because she plays fetch! This is great! We love learning new and useful behaviors. Winning this prize pkg would be such a big help for us right now. Thanks for the contest. Yes my dog knows it. My dog knows a few basic commands. We got her as an older rescue dog that had been abused. She’s making great strides, really smart and wants to learn tricks. My dog doesn’t know this trick, but I’ll definitely try this method in teaching it! Yes, my Dog is great at this game! I usually use praise (petting) instead of food treats. We learned this trick in puppy class. not his one, but he loves learning new tricks so i will have to teach him! nice! we have never used a clicker before! i have worked with this trick with my girls. the older girl was really good. sometimes the girls will come and go to a place but not always. i usually point and say go, then stay. i have never used a towel however, i have used treats. My dog doesn’t know this yet. My shelties know how to do a lot of things but this isn’t of them. No my two sweet girls have not learned this they do a lot of trick and they are tons of fun to teach and watch learn mommy’s girls..
We just say “Go lay (lie) down!” and point and she’ll go over to that general area, but this trick seems more consistent. What an absolute cutie! I have never tried a clicker or to be honest heard of them that much. I have taught my boy simple commands and he seems to follow really well. I think I will try the clicker next! Neither pup knows this trick but it would be useful to teach them place when people come over since they can be overly excited. Bella, Terra, and Kronos somewhat know it, although we could brush it up since we haven’t worked on it in awhile 🙂 Great job Charlie! I got a pre-owned rescue dog & she came pre-trained with the place command. So, I didn’t have to train it. Actually, if you put anything even semi-soft on the floor she thinks she is supposed to go lay on it (from a coat to newspapers to a new dog bed). I shaped this trick. He could use some work with it on distractions though. I have only been using the reward system but I’ve been thinking about trying this method out as well. Since we adopted our Sky she has been very willing to learn but now when I pull out a treat she starts rolling over. We are working on staying for longer than a minute has been a challenge so maybe this would help! My dogs know ‘go lay down on your bed.’ We didn’t use a clicker, but seems a lot easier. We just had to repeat it over and over again. Ours is still a puppy, we are still on stop, stay and no right now but will be later on. Just the basics, Sit and give the paw. I have not tried a clicker. After watching your great videos, I learned I should give it a try. My rescued furkids are currently learning this..
We tried a clicker with my fiancé’s dog. It didn’t work well because she is always distracted by anything. She actually had to work with a behaviorist to get better. Since then she is much easier to teach. My little guy is another story. He knew all his commands when we rescued him, but he choses when and when not to obey. One of my cats will go to his bed if I point at it and say bed (or box since they have both). The other cat and dog are not that compliant but the clicker may work for them! this is high on my list of tricks to train. Such a great command. Especially when people come over but we don’t have a lot of visitors to practice this! I’m in love with your step 5 video. Charlie is laying on the edge of the towel and when you say place he’s like “Um, I’m there. Don’t you see I’m touching it? !” And your cat getting comfortable totally made me smile. This is a trick I need to teach my dogs for sure. No, our dog doesn’t know this trick. My dogs don’t know any useful tricks, just give kisses for bites. Josie knows this trick. She can be stubborn though. We didn’t use the clicker. Very fun shaping trick. Love the videos and all instructions. Nice work. My dog is not capable of learning this trick! My dogs do not know this, but it would be nice if they did. We will give it a shot. Tricks aren’t our strong point. Does sit and stay count as a trick?! I’m going to have to try this trick. It’ll be useful when guests come over. Both my dogs know this and we use it ALL the time. lol sorry no my dog doesn’t do that.. The only trick she knows is tricking me into feeding her another treat! one of my pups can do this, but the other one isn’t able to. Never taught the trick. No real reason to, for us. Gavan does sorta do this on his own, anyways. And I don’t like clickers, at all. I feel like I should try these instructions too. While my baby knows the use of a clicker in training and usually obeys commands, sometimes excitement still just wins over reason, lol. No…my Febe is an old pug and really just does whatever she wants. My dog does not know this trick. She has a mind of her own, unfortunately. I have a cat that likes to play fetch! We took our dog to puppy school – our only issue with her is she bolts when she sees deer. My dog never learned this trick. They know crate but I used treats only with no clicker…I am interested in the clicker method! my dog laughs when i put a rubber chicken on my head and dance around..at least he did..doggie heaven! No trick My dog is for companionship. No, my dog doesn’t know this command. Sadly to say my dog doesn’t know tricks. maybe sit and stay. I don’t have a dog yet, waiting for a friend’s dog to have her puppies! But I will definitely use these methods to train my puppy! This is great! We are going to work on this trick tonight! Good job, Charlie!! No, my dog does not this. I do have one dog that knows sit, lay and shake. The other 2 dogs don’t know anything. She doesn’t know this command, but if I tell her sit and then say stay she will. I could not ever teach my dog to do tricks his best trick was eating and begging for my food. No, our dogs don’t know this command. It would definitely come in handy though. We never taught this command to our dogs. They seem to learn for themselves. Unfortunately my dog doesn’t know any tricks. I’ve tried to teach her several times in the past but she just doesn’t get it. What a great idea to just use a towel for this. I used a bed with Luke, but then again we had beds in every room in the house so that made it easier. One of the big uses I have for this is keeping Luke out of the kitchen when I’m cooking. I was really surprised when we moved to our new house and I just gestured outside of the kitchen (I didn’t even say “bed” but I had always used the hand signal too), and he went and laid down in the hallway! I don’t think I ever realized that it would work without there even being a bed there. My puppy doesn’t know any tricks yet. Unfortunately my dog doesn’t know this trick. Thanks for sharing! Yes my dog knows this trick. I didn’t teach my dog “stay” in this manner. A clicker was recommended to use in doggie class but we never did. A treat worked well but really, it only took a few times without a snack for him to learn it. My dogs don’t know this trick. No, my dog doesn’t know this trick. She knows sit, lay down, shake hands, and to jump in the air in a circle on command and that’s it. My dog does not know this trick, but I think I may give it a try. It would useful in time when I need him to go to his “spot” and stay there for a certain amount of time. Our Bella does not know this trick. I will have to see if it’s something the girls are interested in teaching her. Thank you! Almost yes. It took a lot longer my husky is stubborn. We use this to tell our dogs to crate or to go to bed at night. They sleep in our room in their own beds. Have never tried a clicker. This looks interesting! We do not know this trick, never tried a clicker. We just got our puppy last month. We haven’t learned this trick yet but we are using a similar method for other training. I actually have a cat. meow! My dog does not do tricks, he is a working farm dog. My dog will go to his spot sometimes LOL. I am going to try this with him for sure. My older girl know this in a different way. I tell her lay down and she will. I reward her with great praises rather than treats. Well, our dogs know the command “bed”, and to go to their respective beds. However, staying there is still a problem! My dog does not know this trick – looks neat! My dog can catch treats when I throw them to her. My dog just sleeps all the time. My dog knows this trick but he kind of taught himself. Depending on where we are in the house we would put him in his crate or on his bed while we’re eating. One day we said CRATE in conversation and in he went, does the same thing when we say BED. It’s fantastic and it’s gotten to the point where he’ll stay there until we tell him OK. Although we’ve taken to spelling the words crate and bed in conversation so that he doesn’t run off to them when we don’t want him to. LOL! I am still trying to teach my 1 1/2 year old hyper pup to place before we go on walks, when people come over, but at least he knows to kennel when people come over! My dog Rotten doesn’t know any tricks! He only has one eye and doesn’t see well so it’s hard for him to learn! My doggie BFF knows “Sit” and she learned it with treats but not a clicker. Cant wait to try this trick! My dog definitely dos not. Yet. Yes, my pup Remy knows this trick. It’s going to be so helpful for getting him to just chill out. He’s so excitable! My doggies doesn’t know any tricks yet but because I just got him recently, I will be teaching him some. He doesn’t know how to go to a specific spot unless it is bed. I love how you broke down the training for this. I think that I could work with a pet to get her there I’m looking to get a new dog or cat not sure yet. Yes, but he only does it if he wants to. My son taught him. No, my dog doesn’t know this trick yet. Yes, both of my dogs know this, and they learned it the same way. Yes my dog knows how to do this trick-don’t remember how we taught him. My dog does not know this trick, in due time. I wish I still had a dog to train with. My German Shepherd was well-trained We even entered a couple of obedience competitions, and we did agility too. SO much fun. I love the process of training, and the bond that’s created. Thanks for sharing! We taught my dog, a Chesapeake Bay Retriever, a few tricks, but without a clicker. We taught him how to give his paw, stay, roll over and fetch his favorite toy. 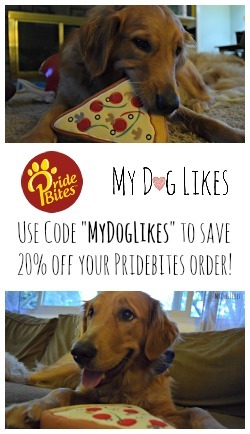 We did this by lots of repetition and associating the behaviors with his tasty treat! I would like to try the clicker however to teach him a few new tricks. Thanks for the nice giveaway! No, my dog does not know this trick or any for that matter. She is a spoiled rotten brat though. Our older dog is very smart and follows many commands. Our puppy is still learning but she is getting the hang of it. my husbands favorite trick is to put a treat on their noses while they sit still. he has them hold it until he says go and then they flip the treats up and catch them. No, she doesn’t know the trick but she is a treat. Thank you for the opportunity! One of my dogs knows his place. When needed we tell him “Know your place” and he goes to his crate. We taught him by saying that when we put him in for the night during crate training. No she don’t know this trick. She knew a lot of tricks when she was little, but she got sick and we quit working with her. She is better now and we just spend time loving her. I will work on this one for him. My dog does not know this trick. I am going to have to work with her some more, she is a 9 month chihuahua and stubborn. I taught her a few tricks but then gt frustrated. I am going to try again though, this hop and seeing all of the tips is very encouraging. Definitely give it another shot! They tend to go through different periods as puppies where they are more stubborn so now she may be more receptive! No, I did not know of this command. He does know “Down” though. He graduated his level 1 obedience class and we were very proud of him for that. Your dog is so sweet, very attentive! Down is a great start for this trick – congrats to him graduating his first obedience class! Thank you for the compliments on Charlie! Every time we teach him something new we remember how much he enjoys the process and that we should do it more often! We didn’t try place. He’s great at Sit, Shake, Roll Over, and Speak though! My dog doesn’t know this trick but she can sit and shake. I will have to try this with her. This is a great thing to teach your dog. There is something like this called the “Relaxation Protocol” that was very helpful for a nervous dog that I had some years ago. That’s very interesting – we will have to look into it! Charlie does have a tendency to get anxious sometimes. My dog doesn’t know this command. My pooch, Princess, is a little reticent about tricks. I think she feels it is below royalty to do such things. But she is alot of fun anyway! My dog is terrible at tricks. She’s too obsessed with food and can’t concentrate. My dog does not know this trick yet but we will work on it. My pups do know this they were taught when they were very young. I am just starting to teach mine Love your Blog !!! Thanks, Linda! That means a lot! No my dog doesn’t know this. The only thing she knows is Sit. I’m afraid my dog has trained me more extensively than I have trained him. It’s hard to give orders to a an adorable little guy who spent over a year at the animal shelter waiting for someone to love him. My dog can do that too. great contest my fur babies dont do tricks but they are my love. My dog only knows how to sit and stay. My dog knows many tricks and he knows how to target and go to a ‘place’. We trained it similar using a clicker. my dog does lots of tricks..plays dead too. I’m a bit ashamed to say that none of my dogs know this command. At least not as you teach it. They do (for the most part) know what I mean when I tell them “bed”, but are not consistent in following the command. I really need to teach them more. Neither of my dogs know this but I would like to try this method. My dog babies don’t know any tricks. They just give lots of cuddles! I have 2 dogs, one of them can do a few tricks. I’m going to try these on her and I know I will get progress! The other pretends to not understand us, but we think she’s a pretty smart cookie! Unfortunetley, my dogs do not know this trick. But now I have to try this with them. I think, before you train the dog, you must train the owner! I admit, I’m a softie and therefore inconsistent with training. I promise to be better! We don’t use a clicker but he knows this trick. We have not taught our Golden Doodle this command yet. When our dog gets up in the morning, he has to go to all 4 of us to get a good morning. He is a barker and doesn’t like to obey all the time. My dog Brutus does know this trick. We have never tried a clicker … I will be getting one :). My dog knows the basics. Sit, shake, and such. Sheba is still a pup and thinks everything is just a game so does not know this trick yet. My dog has been taught other fundamental tricks; not this one yet. This would help so much. My dog doesn’t know this. i have never been successful in teaching my dog any tricks. Good article. I’ve never formally taught Ted “bed” but think it’s a good idea for him to know how to go where I point and wait there. This would be a real challenge! We have TWO small dogs (Shih Tzu’s), I don’t know if they are trainable at this point, they kind of train us! They are very prissy little ladies! Worth a try I guess. They do love treats though!!!! I have to admit that my dog doesn’t know a lot of tricks. However, he does know the basics like ‘sit’ and ‘stay’ (he knows what it means, but doesn’t do it well). And he knows ‘belly rub’…because he loves them so much. It all comes from repetition! I miss Kaden… sniff sniff, tear tear. Nope, doesn’t know this trick. Not even close. My Puppy has not learned this trick or many yet! No, I have some stubborn pups that don’t seem to want to learn any tricks! Our little Pita can stand on her hind legs & spin around. No training- she just started doing it one day! My one dog knows this but my other does not. I did a different method because I did not use a clicker but I do say yes and use encouragement!! This only works for us if the crate is the “place” – she always goes in and stays there – still working on other areas with this…..
My furry baby, Coco, she always has been very easy to train since I got her home from the shelter. I never had a clicker to use but the treats worked great. My doxie can sit up on her hind legs and she can dance for her supper. That must be so adorable – we would love to teach Charlie to do this! I haven’t had a dog in quiet a few years. I’m more of a crazy cat person. I didn’t know about this trick. We love cats too! Do yours know any tricks? Ours will fetch (if the feel like it!). My dog can sit…but not on command. Unfortunately not, he is pretty darn cute though hehe! Neither of my dogs have this down. But they’re great pals to have around the house! No not quite yet. But these are some great tips, I will have to try them with him. Good luck! Please stop back and let us know how it goes! Yes my dog knows this trick! We have been teaching her tricks since she was a puppy! Dogs know mommie and daddy. Get out of the kitchen. When they do something I want them to know then I say the word and soon….ta-da…They know my language. Ours knows most of the basics and can pick out the exact toy we ask her for. Never tried this trick, but she does love treats!!! I would love to name our toys and teach them this! Great idea! My dog doesn’t do many tricks, but she is a good dog! My dog doesn’t know any tricks but she’s well behaved. Having said that, I’d love to see how she does with a clicker. Oh, you’re not alone – Charlie isn’t always the angel he appears in these videos! My dog’s know this trick.I did not use a clicker,instead I used my voice and treats. Wow, I love the laundry idea! I think that we should work on that one! My Boston Terrier is probably the only dog I’ve had that I HAVEN’T taught “place”. I tell him GO LAY DOWN and sometimes he will, but I need to be more specific like with a mat. I’m in the process of teaching my dog the place command using the same method. My dog is a 115 pound 4 year old Black Lab/newfoundland that is very stubborn so it takes a little extra time to teach him commands. Bo is our Boxer. He can shake and sit.Also, he loves to stand up and hug you.He is very sweet. My dog somewhat knows this trick. I use a “verbal click” i.e. *YES* said in a certain way, instead of a clicker, so I am not stuck trying to find/make sure I have a clicker with me. I like the idea of using the towel… i.e portability. My dog is too smart to fall for tricks. My dog pretty much learned this trick by himself. A few treats helped, but it was an easy process. None of my dogs can do this. I think when you have multiple dogs it’s hard to keep their attention. That is definitely true – we need to separate them and work one-on-one for any training. Your doggie is so cute!!! No, they don’t know this yet, but am working on clicker training, so hopefully!! I’ve never used a clicker, but have thought about it when we get another puppy. My Boston Terrier knows this trick. It came easy because she has always been my shadow following me everywhere I go! I definitely need to add this trick to our arsenal! My dog knows this command but she has always loved going to her bed. Even if we say we are going “to bed” she will head straight for hers. My dog friend doesn’t know this trick YET, but its a great project! My dog knows a lot of tricks, but this is not one of them. He also doesn’t know stay, and they seem similar! Our dog doesn’t know this trick, but she is a loving, loyal dog and we are lucky to have her. Thank you for the chance to win. No, our pup does not. We don’t have a clicker, but one of my daughters has a distinctive low whistle that we use to show approval. Problem is when she is not around… We are working on it though. Yes, my dogs all know place, taught the same way. My dog knows lots of commands and a few tricks, taught the same way. My dog does not know this exactly, but she does know to go to certain spots that I point to. My dog knows it specifically when it comes to bedtime. I tell her when to get in bed and she does. I purposely taught her what the bed was, but she just started going there when I told her it was bedtime on her own. I recently adopted my puppy and she doesn’t know this one yet, but we are working on it! My dog doesn’t know this trick. She is still little so there is plenty of time to work on it. I’ve never tried clicker training. Unfortunately my dog knows no tricks…………. I am going to have to give this a shot. we haven’t ever tried the place command. My dog knows a couple tricks – paw, speak, spin and sit. No my dog dose not know this trick. I wish I knew of it before. Thank You I will work on it for next year. No dog, I’d love to win the gc and any dog treats I win will go to local shelter. That seems like a really useful behavior to learn. My grandmother’s dog is very well trained. She adopted Penny last year at the age of 5. She listens and follows commands including sit and stay. She does a cute little dance when she has to go potty and does doggy yoga before jumping up on the couch or in someone’s lap. Yes 2 out of the 3 do. All I need to do is snap my fingers and point. Our 3rd is a rowdy boy and can’t handle staying in place for more than 5 seconds, we are working on it though! Our dogs were real quick to pick up commands, we used treats. My dogs know nothing. They will sit for a cookie, sometimes, that’s about all the tricks they know! Thanks!! yes my dog knows this trick, we used the same method! The older dog knows this trick. No, she doesn’t know this trick. I like the clicker idea. No, my dog does not know any tricks. My dogs do not know this trick. But I am going to try it! Fantastic giveaway, thanks so much for the opportunity! No, but we’ll have to try it! Yes, She does know this trick. No I have not taught her that trick. No, my dog doesn’t know this trick, but maybe I will try it. Thank you for the giveaway! My daughter uses treats and her dog is pretty good at listening. He is still very young and learning.. Yes my little Dino knows it and more! He’s amazing! I have 4 furbabies and none of them know this trick. My Molly jumps and catch treats in the air. My Red will sit and shake hands. My little Cujo don’t do tricks, but understands everything I say to him, such as, move over, get down, or do you want to go outside? My baby Finn is just a puppy, I am doing pad training with her now. I have a cat instead of a dog, and he doesn’t really know any tricks, but my sister’s dog does. Neither of my dogs can do this trick! My dogs do know this trick. My dogs love to sit in my lap and sometimes I will be drinking a hot drink, doing something or just need them down. So I have taught them to go to their beds. I taught them by praising them when they did it. I don’t think our dog knows any tricks. She is really good at chasing a ball, though. My bulldogs do not know this trick, but i’m definitely going to teach them using the same strategy. Our dog knows this trick. The grandkids love ❤ to have him do tricks. Yes my dog knows stay, sit and down. If I say bed or cage, my dog will go to the respective location. I trained him using training treats and lots of praise. Never tried a clicker though. Yes, my pup knows to go to his bed or blanket or spot when requested. He learned with food rewards and “atta boys”. No my dog doesn’t know this trick or any others. No, he doesn’t know this trick; I’m willing to try this method; he seems to have learned other behaviors just through approved repetition. Most dogs learn this command fairly quickly. With just a few short training sessions, we should train our dog with care and patience.